The original recipe for this cake came from Chez Panisse desserts but the center always caved in so I tried David Lebovitz’s adaptation and it is perfection! 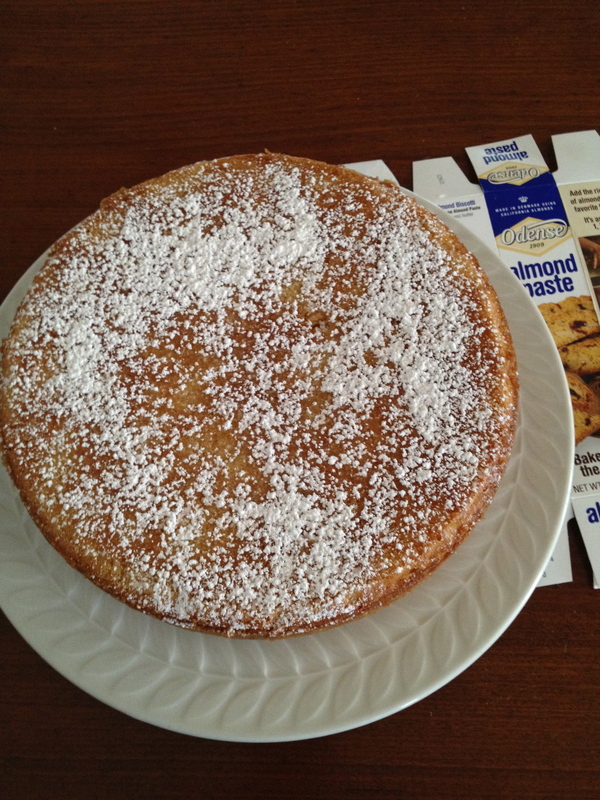 You can find the almond paste in the baking section of your grocery-it is not marzipan! The brand I use is called Odense and you can see the label in the picture. Make this in a 9″ or 10″ springform pan. You make the whole cake in the food processor, which makes it so easy! I live at 5,000 ft. so I cooked the cake 15 minutes longer than the recipe calls for. If the middle is jiggly, cook a little longer and keep checking, every 5 minutes. This cake is delicious with tea or coffee or as a dessert. You could serve it with whipped cream and fruit. I am thinking about caramelizing some pear slices to serve it with tonight! Note: I think the key to keeping the cake from sinking in the middle is to make sure all of your ingredients are at room temperature. 8 oz. butter, cubed, room temp. 6 large eggs, room temp. Preheat oven to 325 degrees. Butter pan and line with parchment, butter and flour. In processor, pulse almond paste, sugar and 1/4 c. flour until fine, like sand. In a small bowl, whisk together the 3/4 cup flour, baking powder and salt. Add cubed butter and extracts to processor and blend until smooth. Add eggs, one at a time. Batter may look curdled, but no worries! Add flour mixture in 2 batches. Scrape sides of bowl, as needed. Bake for 65-80 minutes, until brown and top is set. When cool dust with powdered sugar.